2.8 out of 5 based on 33 bloggers and 4 commenters. 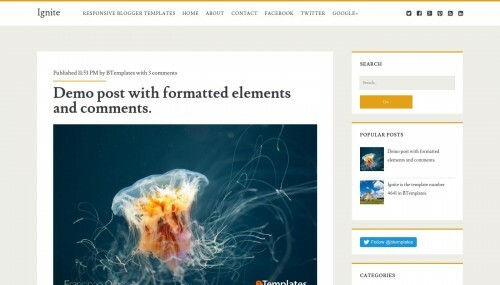 Ignite is a free blogger template adapted from WordPress with 2 columns, responsive design, seo friendly, right sidebar, social bookmarking icons and posts thumbnails. Excellent template for blogs about any general topic, to write a diary, photography, a personal portfolio site or travel. Thanks a million btemplates.com, I downloaded a free blogger template here(ignite) and install on my blogger blog. It was beautiful and I loved it because it almost look like the wordpress ignite theme. This template is terrific. Thank you. Can you please tell me how to make the font size bigger throughout the blog? I a not a developer but if you tell me how to go into the HTML and change the right code to make it bigger I can do it. Thank you!! !